Do you have a sweet tooth, or happen to know someone who does? 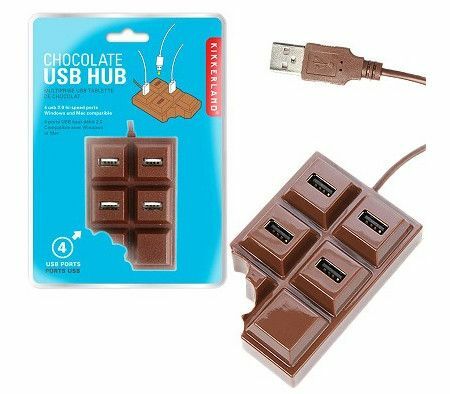 Then this coming Christmas, you might want to shortlist the $9.99 Chocolate Bar USB Hub as a gift from you. Sure, it looks delicious and all, but you sure as heck would not want to bite into it. Even better news is, it will not attract any kind of ants or pesky insects to congregate all over your desk, since there are no crumbs to fall off in the first place, let alone in this being inedible. What the Chocolate Bar USB Hub does is, it lives up to its name – sporting a quartet of USB ports that will hook up a plethora of accessories to it, although it will not carry any of the fancy high speed USB 3.0 ports. You have been warned! Get this for someone whom you don’t like then, eh?